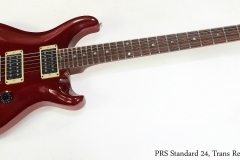 The PRS Standard 24 model was introduced in 1987 and built till 2009, and was based on the very successful original PRS design, with a solid Mahogany body and Rosewood fingerboard. This example dates to 1995 and is in good original condition. Fretwear is minimal and while there are a few small dents and scratches, overall the finish is in good shape. The PRS contouring and carving makes for a very comfortable, well balanced guitar. 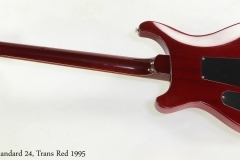 The PRS Standard 24 body is solid Mahogany. The back has a comfort contour and the top is carved, with the same profile as the maple-topped version. The neck is also Mahogany, with a set-type joint, and has an unbound Indian Rosewood fingerboard. The position markers are dots; the circular design uses a mix of Mother of Pearl with an Abalone insert in the shape of a crescent moon. All the key features are here – the carved top, locking tuners, PRS six-screw vintage style trem, HFS Treble and Vintage Bass pickups, three way switch and coil tap. It plays well, and the original hard shell case is included. Currently, the Standard 24 in this design and feature set is available only as an SE model, built at a high end plant in Korea. The original PRS Standard 24 line – including this guitar – was built at the PRS facility in Stevensville, Maryland.